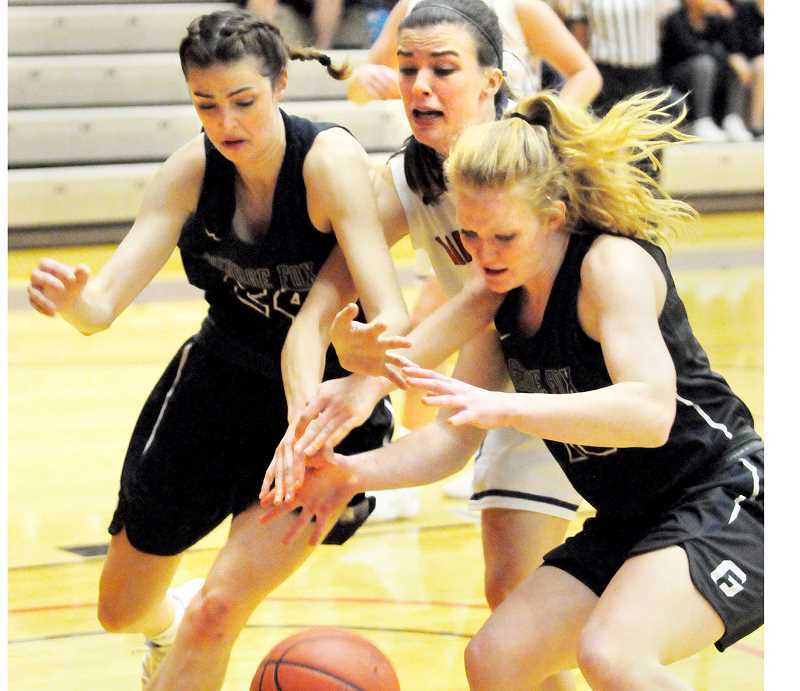 SALEM — The George Fox women's basketball is accustomed to getting team's best shots when playing on the road in the Northwest Conference, so it was no surprise when Linfield and Willamette went toe to toe with the Bruins on the first weekend of league play. GFU coach Michael Meek's team, however, showed why George Fox has been one of the most consistent programs in the country, responding with strong fourth quarters in both games to pull off 83-75 and 79-76 wins, respectively, for an encouraging sweep. "I think we've been doing a better job in that area," Meek said. "I think this group is very competitive and is having a fun time together. It's been neat to see their progress. We knew going into the weekend that we're going through a really tough stretch of road games here. We feel fortunate that we got through the weekend and are moving forward with things." It was a wide-open affair in the first half Friday night in McMinnville, as the Bruins jumped out to a 26-22 lead after one quarter. Both teams shot well in the opening quarter, combining to go 16 for 27 on field goals (59.3 percent), but the host Wildcats took it to another level in the second period, hitting 11 of 12 field goals to explode for 27 points and take a 49-47 lead into the break. "I feel like we had a couple of good runs and they matched them early on," Meek said. "It seemed like every time we'd make a run, they'd come back and they'd make a run. So I'm proud of how the kids persevered through it. They had to shoot 78 percent in the first half to stay in it, which is phenomenal." Things calmed down a bit in the second half, as George Fox limited Linfield to 6-for-16 shooting in the third quarter and drew level at 64-64 entering the fourth. The Bruin defense clamped down from there, forcing seven turnovers in the final 10 minutes, both with its full-court press and half-court defense. Tavin Headings and Kylin Collman combined to score seven points in the first 2:27 in the fourth quarter to put GFU up 71-66, with Hailey Hartney later adding a three-pointer and Kaitlin Jamieson scoring down low to make it 76-69 with 4:21 to play. The Wildcats (3-3, 1-1 NWC) began fouling at that point and although the Bruins went just 7 for 12 on free throws the rest of the way, it was enough to close the game out. Headings scored a team-high 19 points to pace the attack, with Collman posting 16 points and Hartney and Jamieson adding 12 points apiece. "Some kids really stepped up and did some great things," Meek said. "We forced 27 turnovers and that's a great thing, but I think the main thing was we were able to wear them down as the game went on. I think that's what our pressure does to teams. We're hoping to get it close in the fourth quarter and use that. This is a tough place to play." Willamette also put together a strong first half Saturday, jumping out to a 26-16 lead after one quarter. The Bearcats led by as many as 13 points early in the second before the Bruins got going offensively and closed the gap to 42-41 at the break. It remained tight into the fourth quarter, with George Fox finally regaining a 64-62 lead on a Collman three-pointer with 7:34 remaining. Meek said he was especially proud that his team turned the ball over just six times in the game, while Headings was a perfect seven-for-seven from the field to lead the Bruins in scoring with 18 points. Collman was right with her for the second straight night, adding 17 points. "Both of them had great weekends, but I think a lot of that is attributed to the fact that, as a team, we just really shared the ball well," Meek said. "I feel like the balance our team is having this year is getting stronger and stronger." The Bruins (4-2, 2-0 NWC) return to non-conference play Saturday with a home contest versus UC-Santa Cruz at 4 p.m.